What Day Of The Week Was March 2, 1949? 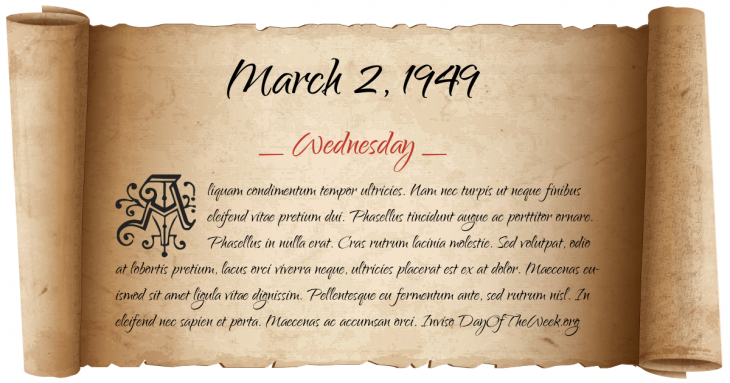 March 2, 1949 was the 61st day of the year 1949 in the Gregorian calendar. There were 304 days remaining until the end of the year. The day of the week was Wednesday. A person born on this day will be 70 years old today. If that same person saved a Penny every day starting at age 6, then by now that person has accumulated $234.26 today. Captain James Gallagher lands his B-50 Superfortress Lucky Lady II in Fort Worth, Texas after completing the first non-stop around-the-world airplane flight in 94 hours and one minute. Who were born on March 2, 1949?